Rice candy from Zhangren Workshop is a well-known Chinese specialty from Dujiangyan, in the province of Sichuan. Since the product is often imitated, this design concept aimed at following a new approach by creating a package that is inspired by nearby Mount Qingcheng. Called Mount Zhangren in ancient times, this mountain is considered the birthplace of Taoism and features a historic monastery which has always been visited by scholars and monks, not least for seclusion and meditation. It is also said, and this is the core of the brand story, that the very first rice candies were made here and served here to followers. Therefore, the bag, which is inspired by the look of a typical rice bag, shows the illustrated image of a monk. 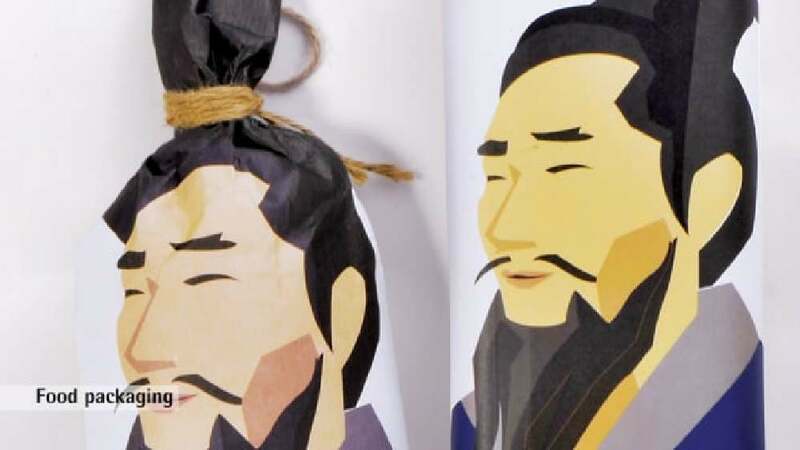 Its distinctive feature is that the bag’s opening is sealed with a rope, corresponding to the bun hairstyle of the shown Taoist monk, whereby the packaging creates a visual bridge to its contents. The packaging design for this traditional Chinese product interprets the contents in a modern way, with an outstanding illustration. Having the Taoist’s hair, respectively his bun, as the closure, which is wrapped round with a strong rope, is not only a great and innovative idea, but also gives the product a strong visual appearance. As a result, a recognisable and well thought-out brand design was developed.